A long-term in vitro conservation protocol for five micropropagated grapevine rootstocks (3309 Couderc, 110 Richter, Vitis riparia Gloire de Montpellier, 101-14 Millardet et De Grasset, and Teleki 5C) was developed and optimized by testing the effect of culture containers (polyethylene bags versus glass test tubes), explant types (rooted versus unrooted cuttings), low-temperature regimes (1.6, 4.0, and 7.2°C), and light intensity (low versus dark). 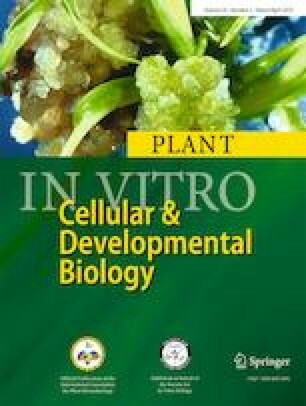 Optimal storage conditions were achieved at 4.0°C and low light intensity (3 μmol m−2 s−1), with rooted plantlets established on woody plant medium (WPM) supplemented with 15 g L−1 sucrose and 37 mg L−1 cysteine in polyethylene bags. After 12 and 24 mo of optimal cold storage, the plant condition ratings (3.5 and 2.5 on a scale of 4) and survival rates (75% and 52%) were high, regardless of the rootstock genotype, as determined by visual observations and viability assays of subcultures on WPM supplemented with 15 g L−1 sucrose and 37 mg L−1 cysteine at 25°C, high light intensity (33 to 45 μmol m−2 s−1), and 16-h photoperiod. Prolonged storage at 4°C under low light intensity reduced the number of subcultures by 4- to 8-fold over 12 to 24 mo, which substantially lowered costs and labor, and provided opportunities for long-term germplasm conservation. Additionally, the use of polyethylene bags reduced storage space in the growth room and in a microprocessor temperature-controlled refrigerator, and also facilitated the safe exchange of germplasm across regulatory boundaries. The post-doctoral fellowship from the Islamic Development Bank to Hussein Alzubi is acknowledged. We are grateful to the late Dr. John Barnard for the advice with statistical analyses. This work was partially supported by Vitis Biosciences, USDA-APHIS-National Clean Plant Network, and state, federal, and institutional funds appropriated to the Cornell University New York State Agricultural Experiment Station.